The holidays are upon us with Thanksgiving just a few days away and Christmas soon to follow after! For every business, it is our customers and clients whom we owe many thanks to. The holiday season is the perfect time to give back and show appreciation! 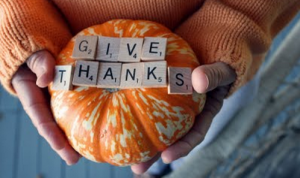 Here are some great tips and ideas on how to give thanks to your customers while strengthening your business at the same time! Host a company holiday party, invite your clients – Provide some snacks and some nice wine, then invite your clients as well as local businesses and individuals around your community. Along with the usual mingling, host a raffle by having people provide their business contact or cards in order to enter. A holiday party is a fun way to catch up with your clients and network with possible new clients as well! Company holiday cards – A card may seem impersonal and generic, but when you take a little time to personalize it with a company group photo or a nice hand written message, a card can really strengthen your relationship with your clients. Special end of the year progress meeting – Show your clients you care by scheduling a special meeting with them to summarize their accounts overall activity and what they can do to increase their profits. Small gift – Think of something that your clients would keep and would see on a daily or regular basis. Make sure your gift is useful and will reflect a positive image of your company and it’s values. Giveaways – Build some excitement for your twitter/instagram followers and facebook fans by enticing them with fun giveaways and contests to participate in. Special holiday menus – Use the holiday as an opportunity to try out new items and recipes for your business. Get your fans into the holiday spirit by creating special menu items that will only be available for a specific period of time. Promotions via Email/Social Media – Sending out a holiday newsletter or posting an Instagram or Facebook offer exclusively for fans would be a nice way to show your appreciation to loyal customers during the holiday season. Ready Artwork would like to say thank you to all of our clients and fans and we hope you all have a wonderful Thanksgiving holiday!